Home » amc , television , the walking dead » THE WALKING DEAD returns with "The Suicide King"
THE WALKING DEAD returns with "The Suicide King"
It's currently taking me about 20 hours to watch a new episode of AMC's The Walking Dead after it premieres on cable. That's out of voluntary choice however, because I'm a good boyfriend. See, m'lady Kristen is a huge fan of this show too... but since we're over an hour away from each other and she doesn't get regular cable (note to self: get Roku as soon as possible) we just wait 'til our schedules can jibe the next day, then we sync my DVR and her Internet streaming and voila: we get to see one of our favorite shows together after all! "The Suicide King" picked up right where "Made to Suffer" ended: with brothers Daryl and Merle together at last. Unfortunately they're in the middle of Thunderdome: Woodbury Edition (did anyone else feel like chanting "Two men enter, one man leaves!"?) and The Governor insists upon a show despite Andrea's protests. What followed was one of the best firefights we've seen yet as Rick and crew came to the rescue. 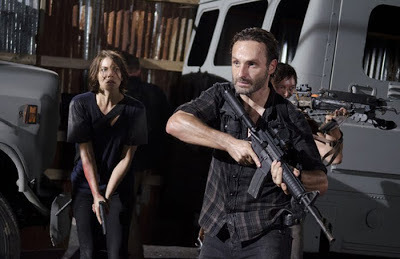 But action ain't the biggest reason why so many of us are hooked on The Walking Dead. This is a well-written, well-plotted drama about very human characters, their relationships and their conflicts with each other. Two thoughts about this episode. First, David Morrissey has now firmly established his portrayal of The Governor as the most menacing, diabolical and certainly manipulative bad guy on television today. The "benign dictator" schtick is losing its benign and if anybody in Woodbury cares, they fast forgot about it. Especially after that little speech that Andrea gave. Who doesn't think that she was doing exactly what The Governor wanted her to do? But that stuff was small potatoes compared to watching Rick Grimes' continuing descent into madness. Good God. The man has gone cuckoo for Cuckoo Puffs full-tilt wacko. Remember that scene in John Carpenter's The Thing where Wilford Brimley went nuts and began shooting and chopping up the place with the fire axe? Well if Hershel, Glenn and Tyrese don't get Rick sedated and restrained Lord only knows what he'll do to himself. Chad Coleman's Tyrese is fast becoming one of my favorite characters on this show ever: there's a quiet and thoughtful determination behind that brute strength he carries, and that's something the group is gonna need. It was also fun to see his former football colleague Hines Ward as a walker (if you missed him, he gets a fairly good closeup before getting thrashed bad right after the group is through the fence fleeing Woodbury). Not the best episode we've seen this season (it's gonna be really hard to top "Killer Within") but still an altogether solid episode to return from a mid-season hiatus from, while changing up the board for what will doubtless be harsher stuff to come.